I’ve commented before that training around power and privilege in groups and society has been gathering momentum in activist circles here in the UK. We’re lagging sadly behind our peers in the States and elsewhere, but at least it’s happening. I’ve been consciously building elements of this work into my group-work trainings for a while now, as have other Rhizome folk. But I’m left with a question about the privilege that many of us social action facilitators have as individuals. And yes, that most definitely includes white, male, heterosexual, middle class, educated me. The simple fact of the matter is that if we (I) are honest many of us have still got a very long way to go on our own journeys of exposing, understanding and acting on our own privilege. And yet we’re simultaneously trying to support other activists to do the same. Ordinarily, with any other training, I’d see that as potentially powerful thing – walking side by side in the journey. The problems arise when I reflect on some of the work I’ve done with other facilitators or alone. Yes it’s done some good. Groups have learnt and shifted. Individuals in groups have learnt and shifted. And I have most certainly learnt and, hopefully, shifted. But I’m aware that some cruel ironies have occurred: that when working on margins and mainstreams I’ve sometimes unconsciously failed to adequately support the margins; that when working on power and privilege I’ve sometimes left the least privileged feeling the most vulnerable or, at best, equally as shaken up as the most privileged. Why? Because in designing and facilitating this work in I’ve inevitably done so through my privileged filters and experience which are more attuned to how the work will impact on people like me – the privileged. I’ve frequently thought and said that a good facilitator doesn’t need to be an expert in the topic a group is working on, just in creating a space that helps the group to learn from its own experience. Nothing too profound there – many of you reading this will share that view. But with work around privilege I find myself a little more wary. Are the risks of us privileged facilitators blundering about with a subject like this too high? Yes, I learn each and every time, but I can learn as a participant, a trainee. Facilitating others isn’t, and never should be, therapy for me. In the immediate future I’ll keep working on and with power, privilege, rank, margins and mainstreams. I’ll endeavour to tread as sensitively as I can. But I think I’ll also be looking around for those from/with whom ‘the movement’ can learn better. One such opportunity should happen this July, when Training for Change’s George Lakey runs a weekend skillshare around this very topic. More on that when the details are confirmed. Thanks for this post, you raise important issues. Great to hear that you’ll be participating in George’s workshop – I look forward to your reflections. * I hear in your hesitancy to jump in to this work a concern about getting it right, or risk causing harm. I have similar concerns, but I’m conscious that ‘getting it right’ is part of my white middle class socialisation, which can make me timid in the world, and actually makes me less effective at challenging oppression and being an ally. So I guess I’m saying we shouldn’t let this hold us back, that we need to be courageous and prepared to make mistakes. All this is advice I need to take more myself! * This also makes me think about what is our work to do as facilitators, and what is the group’s work to do. If we can build a strong enough container (http://www.trainingforchange.org/glossary) participants will take risks to move the group forward. Part of building this container is what we model as facilitators, and I think honesty, openness and risk is a big part of that. I’m conscious of that when I come out in a group. In George Lakey’s book ‘Facilitating Group Learning’ he shares a great anecdote about being open with a group about his white racism, and how that shifted things. * Every workshop we facilitate has these issues bubbling through it – I think I heard from TfC ‘every workshop is a workshop on mainstreams and margins’. Explicitly addressing it only makes it more visible, not more present. * You ask ‘Are the risks of us privileged facilitators blundering about with a subject like this too high?’ Can you say more about what is risked? Thanks again for a thought-provoking post and being open about your own questions. It would be great to hear from other facilitators, as well as participants in worshops in this area. Thanks for all the affirmation Holly. All useful reminders. And thanks for the links. You ask ‘Are the risks of us privileged facilitators blundering about with a subject like this too high?’ Can you say more about what is risked? 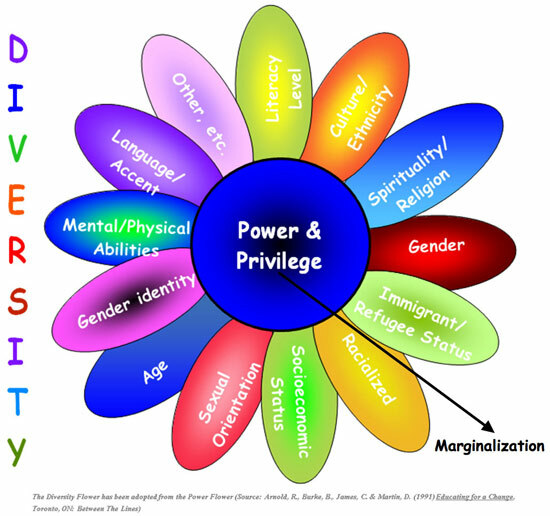 I’m minded of a recent experience in which a co-facilitator and I used a pretty tried and tested tool for exploring privilege. I think it’s fair to say that the group were all pretty privileged, although some more than others (depends on what measure you use for such things, obviously). Our aim had been to raise the issues and let people sit with the discomfort of exploring their own privilege before moving on to reflect on how they could use that same privilege beneficially. Outside of the session we received feedback from a participant who was amongst the least privileged in this group. She felt the exercise had used her status of ‘least privileged’ to benefit the ‘most privileged’ in the group, to sharpen their discomfort, the aid their learning. To her (understandably) this had echoes of wider societal dynamics. We supported the ‘most privileged’ to learn important lessons, but at the expense of the ‘least privileged’ – increasing their vulnerability and perpetuating dynamics of power and privilege. We were fortunate to be given the feedback, and to have time to explore it in depth outside of the session. Invaluable learning, but a lesson I’d rather learn without making the already vulnerable more vulnerable.